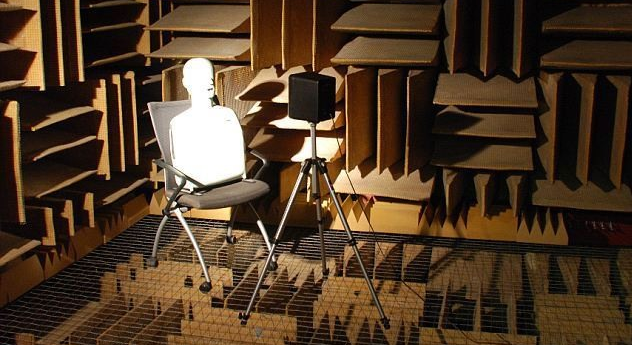 The anechoic chamber — “anechoic” meaning “echo-free” — is behind two heavy vault-style doors and encased in double walls of steel and foot-thick concrete. Inside, the floor is mesh and the walls are lined with three-foot-thick fiberglass acoustic wedges. How quiet is it? A typically quiet library, points out Slate, measures around 30 decibels. In Orfield Laboratories’ research room the noise level plummets to -9 decibels. And since humans can only detect sounds above zero decibels, the chamber is virtually soundless. Stay in there long enough and you may be able to hear your blood pumping. Sounds creepy, right? That’s why the lab’s owner, Steve Orfield, likes to challenge visitors to see how long they can endure the deafening silence. According to Slate, most can’t stay longer than about 20 minutes and emerge disoriented and unsettled. Still, despite rumors to the contrary, the silence won’t make you go insane.